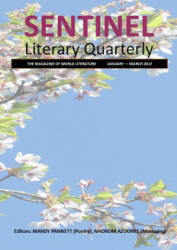 Winning and commended poems from the Sentinel Literary Quarterly Poetry Competition (November 2016) judged by Roger Elkin. Fran Baillie, LESLEY BURT, Richard Craven, CHRISTOPHER JAMES, JOHN LINDLEY, SIMON JACKSON, JACKIE WILLS, STEPHEN JAMES. ANDY MCLEAN, SIMON PERCHIK, DEBASISH PARASHAR, JOHN PAUL DAVIS, MATT DUGGAN, GLEN LYVERS, STEPHEN PHILIP DRUCE, ISAAC ALESH MELCHIZEDEK, AJISE VINCENT, DARREN DEMAREE, MIRIAM CALLEJA, ABDULRAHMAN M. ABU-YAMAN, SIMON FLETCHER, BEN NARDOLILI, HOLLY DAY, LANA BELLA, ALAN CATLIN, WILLIAM DORESKI, AGBAAKIN OLUWATOYOSI JEREMIAH. BRADLEY MASON HAMLIN.